Looking for a healthy new breakfast or dessert idea? 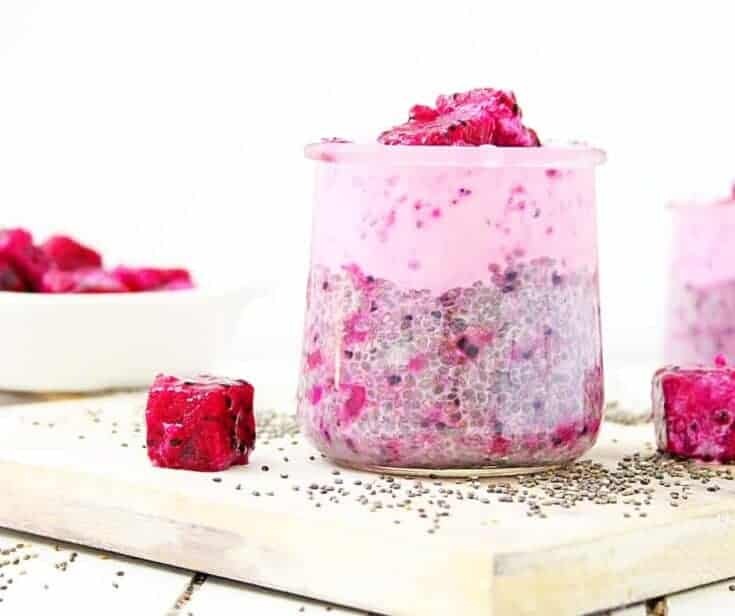 This healthy, real food dragon fruit easy chia pudding recipe is perfect. Filled with the lush flavors (and health benefits!) 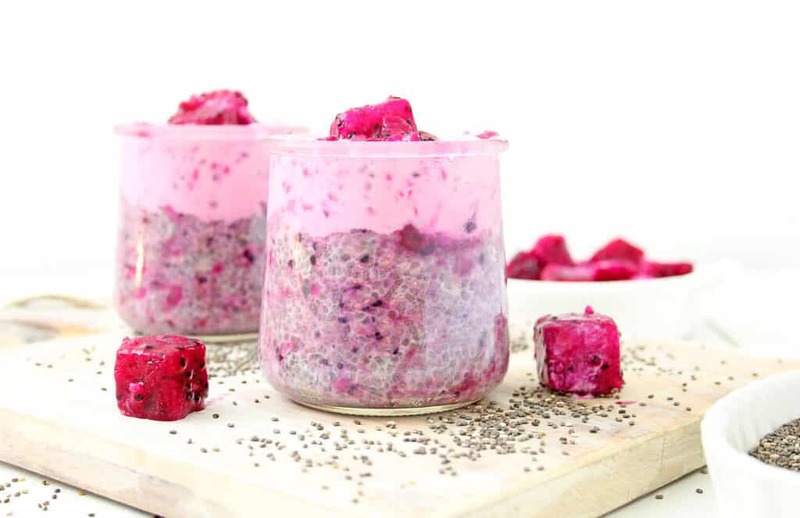 of dragon fruit along with the filling goodness of chia seeds, these easy chia pudding cups are a great make ahead healthy meal idea. If you’re new to the idea of chia pudding, you’re in for a real treat! Chia breakfast pudding recipes can be made ahead and grabbed for a quick, healthy start to your day…or a fabulously indulgent dessert, too. These chia breakfast pudding cups are super easy and they last up to a week in the fridge, so you can meal prep for the week’s breakfasts and snacks at a convenient time and indulge all week long. Chia seeds are a super food. They are packed full of all kinds of good things for your body, and because they expand to up to 10x their size, they also fill you up quickly. Chia seeds are a natural source of protein and fiber, as well as healthy Omega 3 fats and many nutrients. Are Chia Seeds Low Carb? Chia seeds have carbs, but nearly all of it is fiber. That means they can hold a lot of water, and when you calculate the net carbs they are totally okay to enjoy on a low carb eating plan like Trim Healthy Mama, Atkins, and even Keto. Never had dragon fruit? It’s also known as pitaya and grows on cactus plants. There are two types of pitaya. One is white on the inside with less flavor and nutritional value, and the other is a gorgeous magenta color and is loaded with healthy nutrients. The vibrantly colored American dragonfruit (magenta flesh inside) has a mild flavor that is slightly sour, juicy, and wholly refreshing. It’s taste is similar to other fruit of the same color (think raspberries and strawberries) (source). Dragon fruit is packed with Vitamin C, fiber, and antioxidants. In Asian cultures they believe it has youth enhancing and age reducing properties because of the effect of its nourishing profile. It’s also lower in natural sugars than other tropical fruit, making it possible to use in low carb recipes. Is Dragon Fruit Low Carb? A lot of people wonder if dragon fruit is compatible with a low carb lifestyle. One whole dragon fruit comes in at 9 net carbs, so depending on what you eat it with, it’s wholly compatible with your low carb life. It’s also a great addition to a Paleo breakfast. Dragon fruit is great for anyone looking to eat well and nourish their body. If you’re a Trim Healthy Mama, because ingredients trump numbers, dragon fruit is still an “E” so this is a light crossover. 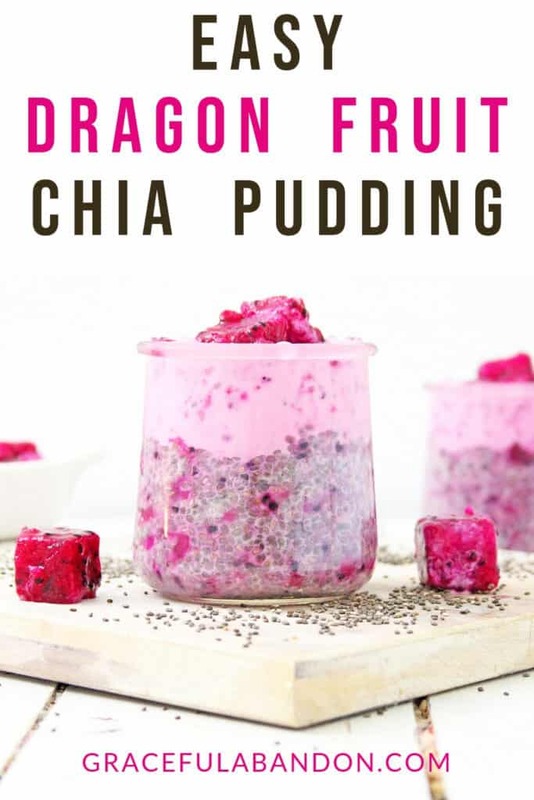 Ready to make your dragon fruit chia pudding cups? It’s so easy! All you do is scoop out the meat of the dragon fruit and blend it with your chia seeds, yogurt, and milk (you can use almond, cashew, or coconut milk if you prefer). You want it completely smooth. If you’re using a fresh dragon fruit, simply cut it in half and peel off the skin, tossing the fruit flesh into the blender. Or you can buy already frozen, cubed pitaya dragon fruit chunks at your local Whole Foods or grocery store freezer section. Side note: If you need a good blender, our family of 10 has used a BlendTec for 6 years now, and it’s still going strong. Another solid option is a Nina Kitchen System (I love the individual smoothie option with this). To me, these are essential kitchen tools because they save so much time! Scoop out the pudding into your jars, only filling them about 2/3 of the way to leave room for the creamy whip topping. This recipe makes 4-6 chia pudding cups when it’s done (depending on which size containers you use). I like to use these 4-oz jars for make ahead chia breakfast pudding, or these 6 oz mason jars (they’re so cute!). 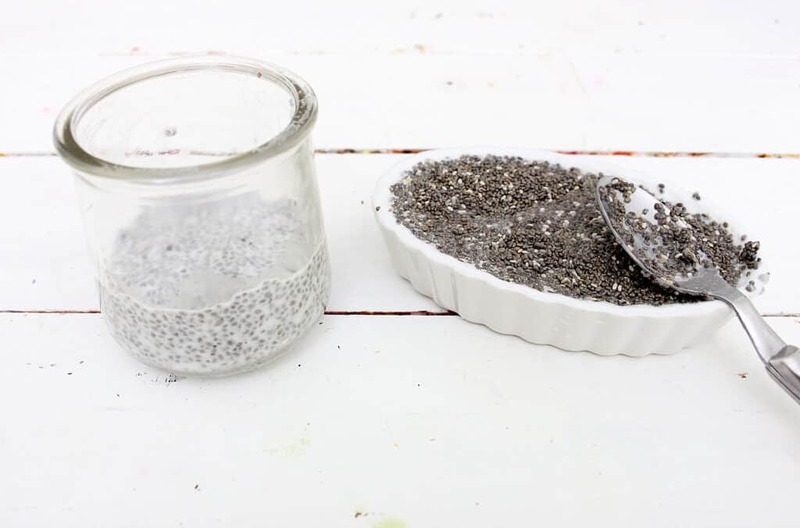 Place your filled chia pudding jars into the fridge while you make the creamy topping for them. Next up is making the creamy dragon fruit whip topping for your easy dragon fruit breakfast chia pudding. In your blender, whip together the milk, yogurt, and vanilla syrup. The mixture will be slightly pink because of the dragon fruit chia pudding you just mixed up in it. Tip: If you’re a Trim Healthy Mama, use 1/4 tsp vanilla extract and 2 doonks of stevia in lieu of the vanilla syrup. Pull your chia breakfast pudding cups out of the fridge and spoon the yummy whip topping onto the pudding. You can garnish with a piece of fresh dragon fruit before serving or just enjoy as is! If you’d like these chia breakfast pudding cups to be low carb, no worries! These make a great make ahead THM XO, low carb, or keto breakfast. Simply use almond or coconut milk in the recipe (coconut milk makes it creamier and more tropical tasting, while almond milk is a tad smoother). One dragon fruit has 9 g of net carbs in it, and split between 4-6 breakfast portions this is no problem at all. And of course, chia seeds are largely fiber, so they are also great for your low carb meal choices, as well. For the yogurt be sure to use Greek yogurt (full fat is fine, and will be creamier tasting). The Oikos Triple Zero vanilla yogurt is delicious here! For a low carb vanilla syrup option, this is the best vanilla syrup! Soooo yummy. And here is a good deal on chia seeds (I love a good deal, don’t you?). If you’re a Trim Healthy Mama, use 1/4 tsp vanilla extract and 2 doonks of stevia in lieu of the vanilla syrup. 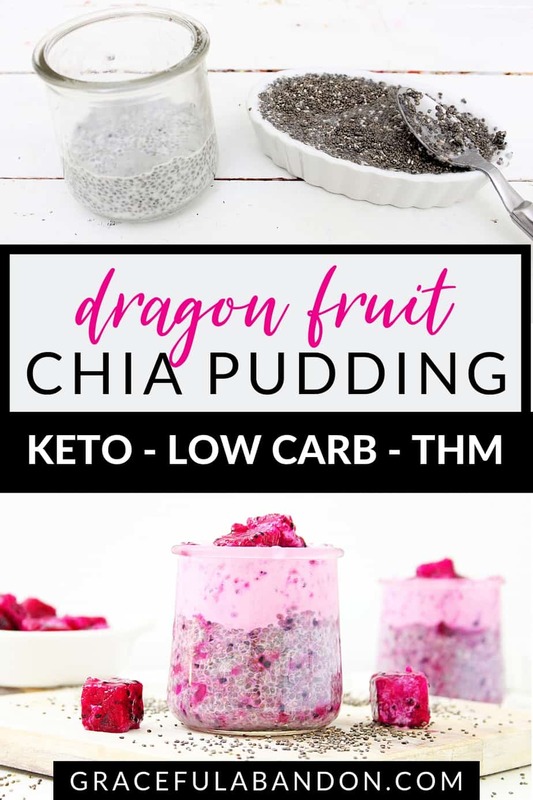 Delicious, simple, low carb chia breakfast pudding cups with dragon fruit. Great make ahead meals for those busy mornings. For low carb, Trim Healthy Mama, or keto please be sure to use almond or coconut milk and Triple Zero or other approved yogurt. Low carb vanilla syrup and be found here. If you're a Trim Healthy Mama, use 1/4 tsp vanilla extract and 2 doonks of stevia in lieu of the vanilla syrup. These cups can be made ahead and enjoyed for up to 7 days from the fridge when stored in an airtight container.